You may have heard from Governor Cuomo that there’s a new tunnel under Second Avenue with three Q Train stations. Exciting stuff, especially if Cuomo and the MTA can wrangle construction costs under control and make future subway expansions cost-effective. Meanwhile, on the surface of Second Avenue, there’s another big improvement that’s been overshadowed by the long-awaited subway — a protected bike lane and dedicated bus lane from 105th Street to 68th Street. The redesign brings a parking-protected bike lane, concrete pedestrian islands, and a dedicated bus lane to what was previously undifferentiated street space clogged with cars [PDF]. On these 37 blocks, the protected bike lane is now complete except for the stretch between 82nd and 88th Street. 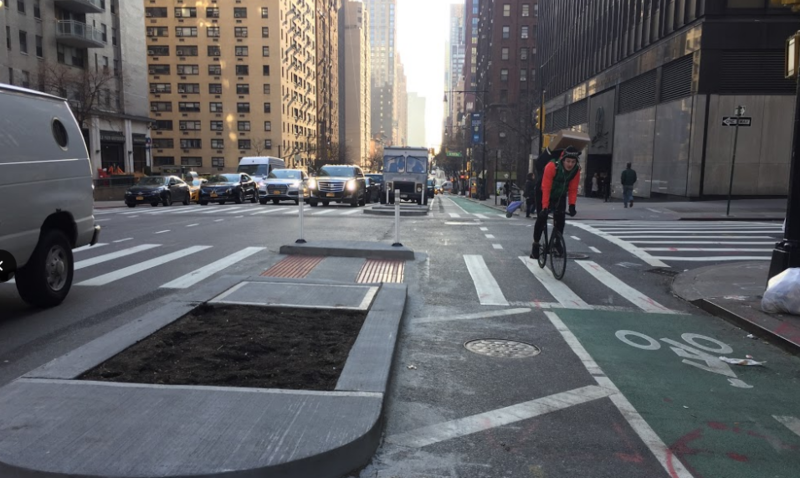 Further south, DOT is set to install a mostly-protected bike lane between 59th Street and 42nd Street. That will leave the blocks between 68th Street and 59th Street, approaching the Queensboro Bridge, and between 42nd Street and 34th Street, by the Queens Midtown, as the two substantial gaps in the north-south protected bike route on the East Side. On First Avenue, Second Avenue’s northbound counterpart, DOT filled a gap in protection on the bike lane between 55th Street and 59th Street. At 56th Street, the gap in protection as the First Avenue bike lane approaches the Queensboro Bridge has been closed. There is now just one unprotected block on First Avenue, between 47th Street and 48th Street. The only building on that block? In a cruel 2016 twist, it’s the Trump World Tower. 2nd Ave PBL to 68th has been completed just in time for the tidal wave of people cycling to/from midtown on UES & East Harlem. Citibike expansion into Harlem this summer will have a PBL. I predict 20,000 to 25,000 bike trips on UES by August ’17 every weekday. This is quite nice growth from August ’12 when there were less than ~3,000 daily bike trips on UES. Woody Allen better start upping his heart medication. The far corner in the first photo does not look safe for cyclists; in fact, it looks seriously dangerous. When is NYC going to start implementing protected intersections? Chicago, Salt Lake City, Davis, Austin, and San Francisco now have them. Cambridge and DC have some in the works. NYC DOT has zero and seems quite content with slapping up “mixing zones” or as I like to call them “Meat grinders” all across the city. The city wants to keep those turn bays because they streamline the traffic, but we could use flex post up to the crosswalk to keep the cars from riding the bike lane into the turn. Been riding the new 2nd Ave PBL as the pieces open and I can already tell you that the unprotected sections near the subway station entrances need flex posts. See the first photo posted here. Those sections need flex posts at least. Been riding the lane as the pieces open and that photo is an accurate reflection of the situation. Also double parked vehicles. I’m confused. Why is this design, which entails a complete street reconstruction (DDC), no different than the standard DOT design? Surely with more time and resources, a more robust design could have been implemented. Anyone have insider info? I’m still disappointed that DOT is leaving cyclists unprotected on Second Avenue at the point where they need protection the most, around the 59h Street Bridge. When I asked them (at a Community Board meeting) about this, I was told that it was because of traffic capacity (and yet they still were happy to have parking lanes on these blocks). I guess our work is not yet done? 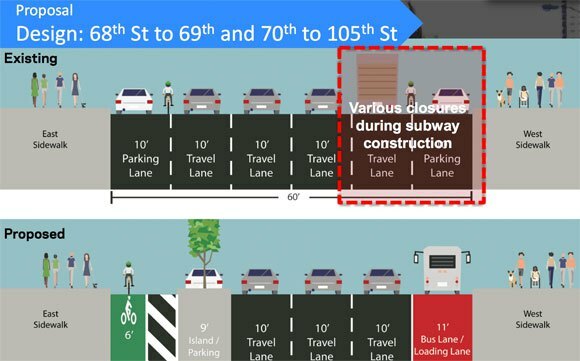 Will 2nd Ave Get Its Protected Bike Lane After Subway Construction Wraps? DOT expects only 10 blocks of the protected bike lane on Fourth Avenue to be implemented this year, and all work is contingent on the progress of MTA repairs to the subway tunnel below the street.